There's really no reason why one should not watch The Big C, says Paloma Sharma. What if all you had was a year to live? What you do before you're gone? What would you finish? Would you tell your family and friends? Would they be able to deal with it? Or would that change your life irreversibly, not necessarily for the better? These are some of the thoughts that run through Cathy Jamison's (Laura Linney) head when she learns that she has been diagnosed with Stage IV melanoma (a malignant tumour associated with skin cancer). The reality of impending death makes her question whether she really has lived, causing the once sweet, considerate high school teacher become who she has been wanting to be all her life. Cathy changes her mind at the last minute about her son, Adam's (Gabriel Basso), trip to soccer camp -- a trip that he makes every summer break -- in order to spend more time with him and causing him to despise her. She also kicks her husband, Paul (Oliver Platt), out of their home since she wishes to raise 'only one child' and she has chosen Adam. She begins to reconnect with her tree-hugging homeless brother Sean (John Benjamin Hickey), who lives in a dumpster behind a mall and spends his days screaming at passers-by about the how their consumeristic lifestyles were causing global warming and destroying the planet. With only a year to live, Cathy is on a mission to do all that she had to do and be all who she can possibly be. But dying or not, her actions still have consequences and the unexplained changes in her personality begin to alienate those she loves as well as making her face sides of herself that she doesn’t. 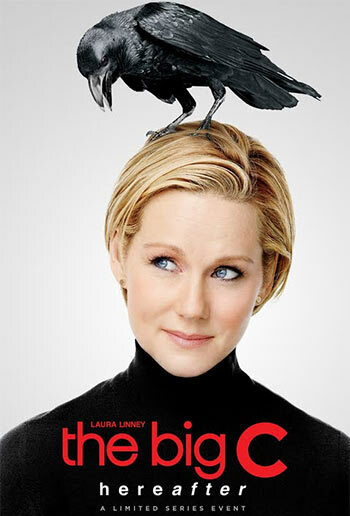 Laura Linney is absolutely perfect. I'd comment on her acting prowess but it doesn't seem like she’s acting at all. Linney doesn't pretend, she transforms, she becomes Cathy. Platt, Hickey, Basso and Gabourey Sidibe, who plays an obese, street smart student stuck in some school who Cathy takes under her wing and persuades to lose weight, provide Linney with more than adequate back up. Despite being a show about terminal illness, The Big C has a strangely warm feeling to it. The characters are beautifully written. They stay relatable and completely, utterly human. There are no saints. No one is extraordinary. Everyone is someone you know or even someone you’re probably friends with. The Big C's episodes, three of which have premiered on Indian television on Colours Infinity, are relatively short and hence find it easier to keep the viewer interested. However, there is no doubt that even if the episodes ran for twice as long as they do now, one would still watch. The Big C is the ideal binge watching candidate. You can’t watch just one episode and let it go. You just have to know what happens next. The script progresses smoothly and the visuals remind one of a perfect summer day. Oh, and did I mention that the soundtrack is absolutely lovely? There is, as far as any rational person can tell, absolutely no reason not to watch The Big C.